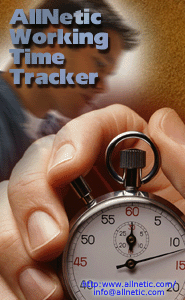 AllNetic Working Time Tracker is a handy tool to monitor and keep books of your working time. AllNetic Working Time Tracker will help you to break down your job into projects and tasks in order to facilitate your time tracking. Now you will know exactly how your time is spent. Integrated invoicing feature makes AllNetic Working Time Tracker indispensable for hourly-paid workers. AllNetic Working Time Tracker uses minimum of your desktop space (in the system tray, beside the clock) to signal on time when you need to start or stop your time tracking. You decide – not your PC – what you are working on at each moment and are you working at all. Your PC is made to help you, not to make decisions for you. This is the main principle of AllNetic Working Time Tracker that will help you in all possible ways. • Unlimited number of projects, tasks and child subtasks. • Each task supports a separate time counter. You can also check the total time for each task or project. • The current status is displayed in the system tray. • Fast access to the main application features (start/stop, task switching). • Automatic monitoring for starting and stopping your job. • Current status and customizable statistics in a pop-up window of the system tray. • Paid time accounting. In a payable task, a time period may be marked as payable. This allows determining how much time have you worked for each of your customers, and how much unpaid time is left. AllNetic Working Time Tracker may be run on any PC with Windows 2000/XP/2003/2008/Vista/7.